University of Nottingham Malaysia > Blogs > UNM Campus News > Campus news > Study at University of Nottingham Malaysia! Search for the University of Nottingham Malaysia Campus (UNMC) online and you would get a barrage of information on the courses offered, fun facts about the environment the University is situated in, the famous alumni, the first class facilities and much more. As such, this post will also add to the topic of why you should come join us and receive an education at the University of Nottingham Malaysia Campus. However, unlike most published materials out there (online or offline) that mentions facts that you are probably already aware off, this post will mention a short list of five reasons why you should study here through the perspective of an existing student. For those of you who are not aware, or at least not aware yet, the University of Nottingham Malaysia Campus is situated in Semenyih. Not Semenyih city centre, but the outskirts of Semenyih. It is less than a few kilometres away from Broga Hill. In not so flattering terms, or in the words of the current students, the University is situated at the edge of civilisation. However, that might not be a bad thing. On the contrary, UNMC is in a very strategic location. It is about a 30-minute drive away from the nearest shopping mall and it is about a 45-minute drive to Kuala Lumpur. By staying in Semenyih, students with their own transportation will be able to avoid the crippling traffic jams that Kuala Lumpur seems to be all too eager to offer, while still be able to visit the city centre from time to time without having to drive for long distances. Basically, students at UNMC will be able to enjoy the peace and quiet Semenyih has to offer while they will have the option to travel to the city centre if they wish. Speaking of travelling to the city centre, there might be a few of you who are wondering “What if I don’t have personal transportation? will I spend my weekends exploring the jungle next to the University for the next three to five academic years?” Fret not, the University of Nottingham Malaysia Campus provides shuttle bus services throughout the week (excluding public holidays) that will take its passengers to the Kajang KTM Station. From there, students are able to travel to other major shopping malls in Kuala Lumpur and Selangor, such as Mid Valley Megamall, The Mines and KLCC. Unlike accommodation in central KL and its surrounding areas, the on-campus accommodation at the University of Nottingham Malaysia is relatively affordable, with base accommodation fees starting around RM450. The 24/7 security and various facilities that include self-service laundry facilities, 24/7 convenience stores, student hubs and covered walkways to all major buildings from your accommodation ensure that your on-campus experience is as pleasant as it can be. However, if you’ve decided not to stay on-campus, there are many other areas that provide accommodation for our students, like Taman Tasik Semenyih (TTS), Broga new village, University Village (UV) and many others. However, it is important to keep in mind that most of these areas require students to have their own transportation. Many universities refer to themselves as ‘a global university’. The word ‘global’ is often used so freely that it’s hard to not spot the word ‘global’ on any other university websites or their promotional material. It seems like almost every university has the word ‘global’ in their tagline and those who don’t, want it. The University of Nottingham, with its campuses located in the United Kingdom, China and Malaysia, stands out as a truly global university. Students who wish to transfer to another campus during their education may do so provided they meet the academic qualifications. Academic staff often transfer between each campus. This contributes to the dissemination of knowledge that UNMC can be proud of, so fret not if you don’t plan to transfer to the other campuses as you will still receive the global education that you’ve invested your time and finances in. 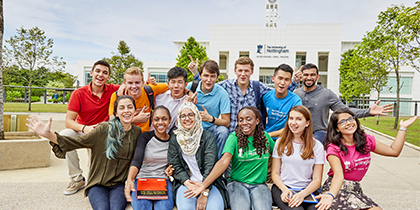 If the truly global experience, the reasonably priced accommodation, and the strategic location for both tranquillity of Semenyih and the bustling city of Kuala Lumpur have not convinced you why you should study at the University of Nottingham Malaysia Campus, then let’s add another reason on why you should. The University of Nottingham (UK, China, Malaysia) is ranked at the top 100 in the world and top 20 in the United Kingdom. UNMC employs around 700 full-time academic staff from various countries and has about 5000 students, which contributes to a ratio of one academic staff to 17.5 students at UNMC, which means it is never too difficult for a student to get academic support. So come and join us at the University of Nottingham Malaysia! We have various open and info days throughout the year where staff and academics will be more than willing to answer any questions that you may have. You can find out more info on upcoming open or info days on our University’s website. That’s intriguing! I will find out more info on upcoming open or info days on your University’s website. It also might be essential for students!